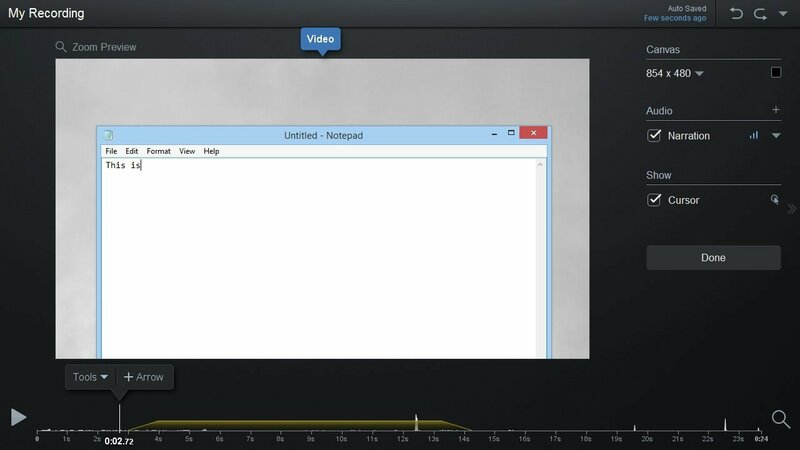 0:00 You can add an overlay to your video and have it change in position or size over time. 0:05 For example if we wanted to add an arrow in our recording which pointed to the File menu entry then slides over to the View menu entry. 0:13 First we'd add your Arrow Overlay over the section of the video we want it to show in by seeking to where it should start and then clicking the Tools menu and the Overlay Arrow option. 0:24 For more help with adding overlays click the icon here. 0:28 Next we'll seek to find where the arrow should disapper and then press the E key to have the overlay selection end point jump to this position. 0:36 Once the section is setup on the timeline we'll position the arrow to where we want it to start which in our case is right over the File menu entry. 0:45 Now that our initial position is setup we'll seek to the position in the video where we want the arrow to point at the View menu entry and click this icon right above the seek bar which will add an "Edit Point" to the timeline. 0:58 Any changes we make to the arrow's position or size when we are seeked to this point or after this point in the video will be applied at this edit point and takes effect at this time in the video. 1:10 So now we can move the arrow to the new spot we want which we could do by dragging it with the mouse, but since the new position is straight over to the right, I'm going to reposition by holding down the Ctrl key and then pressing the right arrow key to move the arrow to the right. 1:25 By default when we add the Edit Point it will have a 1 second transition so the changes we make to the arrow will be animated over that second which we can see by dragging the seek point back and forth over the white span on the timeline. 1:38 You can increase or decrease the transition time by clicking back on the Edit point and using these arrows to increase or decrease the time. When you decrease down to 0 then the arrow will appear to jump without any transition at all. 1:52 If you need to reposition the Edit Point you can click back on it and drag it or use the left and right arrow keys to fine tune the placement. 2:00 When you are on the edit point you'll see a menu to preview the edit points transition which will play over the transition span so you can see what it looks like. 2:09 You can remove the edit point by clicking this icon and unselect the edit point by clicking this X which brings back the normal Overlay menu. 2:17 If we wanted to add another change so the arrow moved again then we can seek to that new spot in the video and add another edit point so now any changes we make from this point on will be applied here. 2:29 But if we seek back between the edit points then changes will be applied to this left edit point again.